Services — The Culture C.O.-O.P. The Culture C.O.-O.P. offers a wide variety of diversity/equity and team-building services in the forms of keynote presentations, training workshops, author visits, and more. The following list includes a brief summary of our most requested services. To receive a fully detailed list of services offered by the Culture C.O.-O.P., or to discuss tailoring any of these services to your unique situation, please contact us at (530) 792-1334 or via e-mail at sandy@cultureco-op.com. Sandy Holman has served as a keynote and featured speaker at numerous organizations, both nationwide and internationally. She has spoken on a variety of topics and has been an honored guest at educational conferences, literary events, community gatherings, and business functions. Sandy also does inspirational keynotes which inspire people to operate at their highest levels. 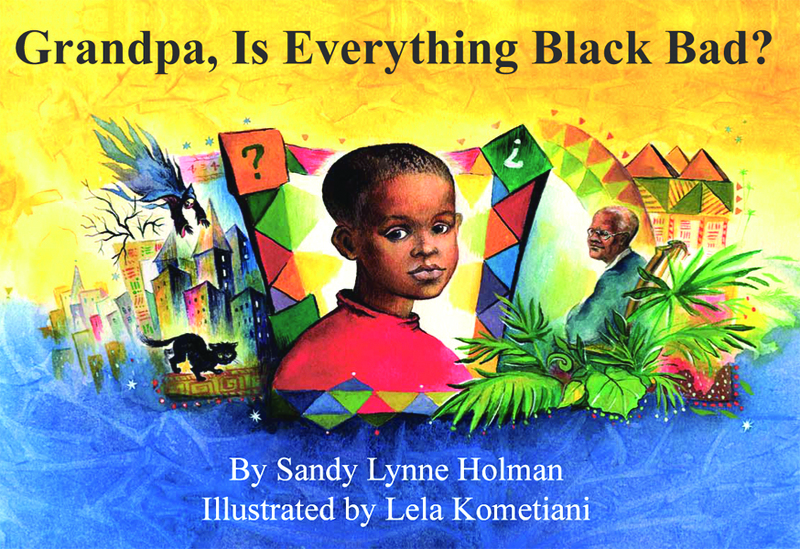 As an award-winning author specializing in multicultural literature, Sandy has influenced thousands with her gentle approaches to dealing with difficult issues that affect our youth and the adults who serve them. She is known for her optimistic and proactive approach towards serving others and has won numerous awards for her accomplishments. Sandy works effectively with both youth and adults. She tirelessly advocates for the support of generally underserved communities, equity and diversity in our major institutions, and for increased awareness of systemic oppression/latent biases present in our public education system. Participants rate her presentations as outstanding! To request Sandy's services as a keynote speaker or to inquire about her past experience, please email us at sandy@cultureco-op.com. The Culture C.O.-O.P. conducts keynotes, seminars, and presentations on diversity/equity. These presentations are designed to increase the cultural competency of individuals and organizations. We work with both children and adults from many different backgrounds and in a variety of settings. Our presentations are designed to be informative, interactive, and insightful on a personal and organizational level. We customize our services to meet your unique needs. This presentation focuses on self-awareness and the importance of self-examination in becoming culturally aware. It helps people to examine their biases and stereotypes, and how these stereotypes affect how we interact with others. This service encourages participants to do exercises provided in a take-home packet that explores individual characteristics and traits more in depth. Click here for a detailed classroom agenda. Diversity 101 is a prerequisite for all of the more advanced diversity trainings. As a sequel, this presentation continues the self-examination that is initially prompted by the Diversity 101 training. It briefly discusses relationship-building and team-building, which are both skills that are critical to becoming more culturally competent. This presentation also investigates basic methods of self-exploration in order to lay the foundation for effective cross-cultural communication, which also plays a key role in becoming more culturally competent. Diversity 102 involves identifying and implementing one possible individual action item. Advanced in-services are only for participants who have been exposed to other diversity training and/or multicultural settings and experiences. These services cover interpersonal relationships in depth, explore key ethnic groups, and the study of institutions and biased practices. These topics expose participants to a wide range of diversity/equity and cross-cultural issues. Institutional systems are explored and examined in detail, as well as the history of "-isms" and their impact on people and organizations today. Participants and organizations are given assignments and personalized plans to increase their overall cultural competence. This presentation explores the historical, systemic, and structural policies and practices that have created the social gaps present in our society today. This service provides participants with a backdrop to understanding critical dynamics that affect our ability to serve vulnerable populations. It also gives examples of practices, strategies, and policies necessary to create healthy organizations that effectively serve their populations. This service is an excellent workshop for organizations interested in beginning a mentoring program or fine-tuning an existing one. Participants learn the key components of successful mentoring programs and focus on how to ensure a program's long-term success. In addition, participants receive a resource list with the phone numbers of valuable contacts and resources. This workshop is highly recommended for any mentoring program or organization hoping to implement one. This workshop gives an excellent summary of key effective strategies used in successful prevention programs. Participants are exposed to the latest research on resilient youth and are given an outline of some the most successful prevention programs in the country. This service is hands-on and is recommended for anyone working with alcohol and drug-related issues. The Culture C.O.-O.P. facilitates team-building workshops for organizations that are trying to build cooperation and efficiency among staff members. These workshops are designed to increase trust and encourage conflict resolution among co-workers. Attendees participate in a variety of exercises and vignettes that address common issues which often hinder the effectiveness of reaching organizational goals. This full-day workshop is designed to be fun and interactive. This workshop is designed to increase effective communication among staff members. Participants will learn the basics of good interaction skills and have the opportunity to practice common communication techniques. This workshop is designed to be inspirational in nature, giving participants an opportunity to explore personal and organizational goals. Participants will discuss common blocks to personal growth that hinder effectiveness in their personal and career objectives. 1) Equity/Diversity Series: These seminars build upon each other, exploring why we are seeing the “gaps” in education and most all of our other institutions. We look at historical practices, policies, and ingrained inequities, fostering an honest discussion on what we really need to explore if we are going to improve the success rates of all students in our schools. Participants enroll in at least 3 seminars. 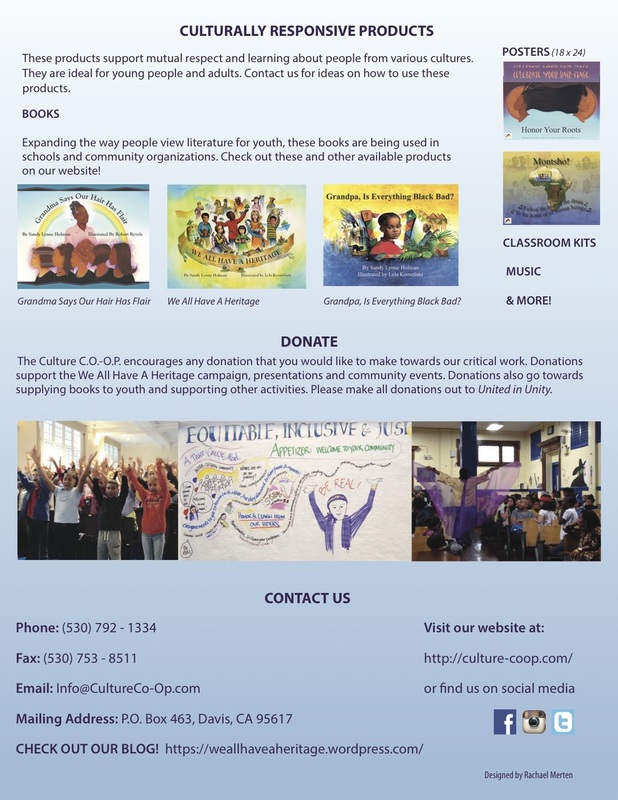 2)We All Have A Heritage: This training explores ways to make learning culturally relevant and responsive through engaging youth in the classroom more effectively and connecting with their world in general. 3) Best Practices for Success in Education: Explores best practices being implemented around the country to impact the achievement gap in school settings. 4)Common Characteristics of Successful Educators: This seminar specifically focuses on common characteristics of educators who are achieving results in the classroom. 5) Using Literature to Lay a Foundation of Success for Students: We all know that the ability to read is one of the biggest predictors of success for students. This workshop will illustrate creative ways to make reading appealing to youth, one of the most critical things we can do to increase their success in school. 6) Partnering with Parents for Student Success: Participants will acquire creative and effective ways to engage parents with the goal of increasing student achievement. 7) Addressing the Whole Child/Creating the Resilient Youth: This presentation focuses on what recent research indicates as key in developing childhood resiliency, including how to improve chances of future life success, and how educators can use this information as an effective tool to improve school performance. 8) Let’s Talk About Race and Gender: A real dialogue on the roles that race and gender play in student achievement and our expectations of youth. 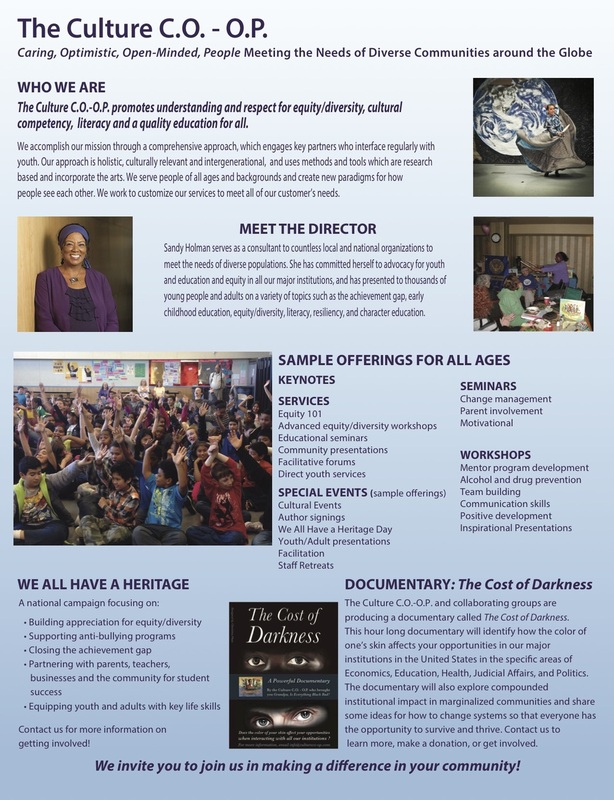 9) The Cost of Darkness: This session explores dynamics (and the unfortunate reality) of “internalized oppression,” which affects youth who have been exposed to messages which tell them they are not capable of learning, are not valued, are seen as “criminals” and much more. Participants learn why this internalized oppression impedes the learning process and examine strategies for overcoming it. 11) How to Make an Impact on a Student’s Learning: Ten things you should know in order to impact a young person’s life. These seminars are designed to address organizations that are being impacted by change. Participants will receive information on the benefits and challenges of change within their organization. It is designed to help organizations transition staff so that they have a deeper understanding of new mandates and goals set by leadership. This innovative and practical seminar discusses how to increase parent involvement in schools and community organizations. Participants are exposed to common and successful practices that have increased parent involvement in select programs all over the country. We have found that parents truly do care and, when approached in the right way, will support identified goals within a variety of organizational settings. This seminar is perfect for individuals and organizations experiencing “burnout” and apathy about their work. Participants are given the opportunity to reconnect with what is important to them and their organization. Exercises that stimulate and re-energize participants are conducted to illustrate how to bring a little fun into each day. Past participants in this workshop often report feeling re-committed to individual and organizational objectives. The Culture C.O.-O.P. offers exciting visits to schools, bookstores, community organizations, businesses, and corporations. Participants interact with Sandy Lynne Holman and engage in a fun-filled, interactive presentation that celebrates living a full life. 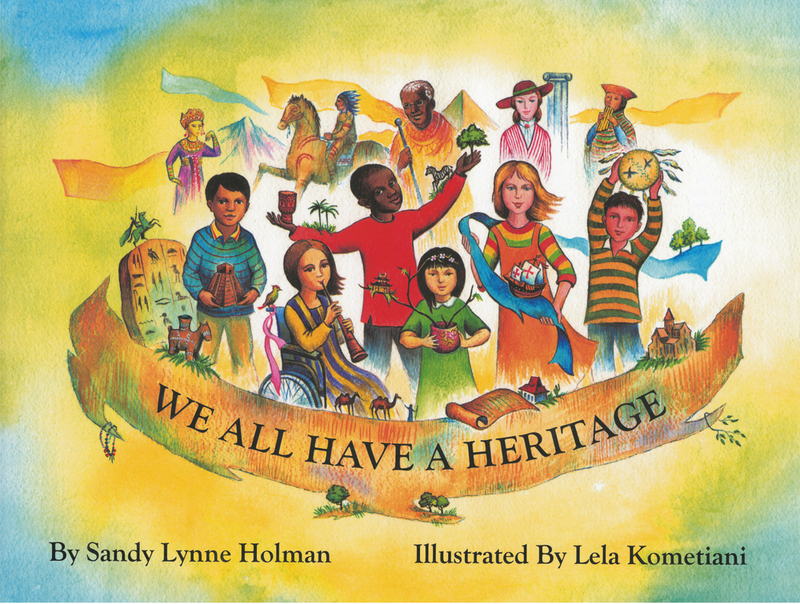 These events also promote respect for diversity, elders, education, and reading. Author visits are one of our most popular services; thousands of participants have already responded enthusiastically to Sandy's boundless positive energy. Her visits inspire people, give them hope, and encourage an understanding of our diverse world. These author visits are appropriate for adults and children alike. Be prepared for a memorable event! The Culture C.O.-O.P. conducts author signings with author Sandy Lynne Holman. Individuals and organizations can request to have Sandy come to their organizations so that staff and members of the community can purchase her books and get a personalized autograph. Sandy also speaks about what is involved in getting your work published and shares what inspires her to do the work she does. Author Signings are subject to availability and fees for appearance. This service is a high-energy presentation designed to complement the “We All Have A Heritage: Many Cultures, One World" Campaign, a national project focused on bringing attention to the critical importance of diversity/equity, cultural competency, literacy, and a quality education for all. This presentation is appropriate for all age groups, and engages both youth and adults in a culturally relevant and responsive way. It also generates excitement and a commitment toward learning and school achievement. This event is designed to assist you in taking the first steps towards eliminating the achievement/opportunity gap and toward creating a school environment where all students succeed. The Culture C.O.-O.P. assists organizations in planning special events for their organization and/or the community. We offer advice and resources to help you ensure the success of your event. We pay attention to detail and specialize in working with our clients to make sure they incorporate diversity into their events. This is a service offered for managing forums on sensitive topics (such as conflict resolution or race relations, etc.). The Culture C.O.-O.P. will assist your organization by leading the forum as a calm, neutral, third-party member. We create an honest and respectful environment in which people can safely share their feelings and concerns about critical topics such as race. With our assistance, these forums can allow participants to move forward in proactive and constructive ways, and to collaborate on ways to address issues in their communities. The Culture C.O.-O.P. facilitates retreats for staff that honor the true meaning of the word "retreat." These events are designed to give organizations an opportunity to honor and give something back to their staff. Participants have the opportunity to feel pampered, appreciated, and reenergized about the work that they do. The day is fun, productive, and inspiring. Although organizations requesting staff retreats may request that some organizational planning occur, we encourage clients to keep this to a minimum. Many have found that giving their staff a true retreat results in many positive outcomes for their organization.